Last time we looked at setting up and optimizing your website. In this post we will consider the content for your website. Maybe you have heard that when it comes to creating an effective online strategy . . . 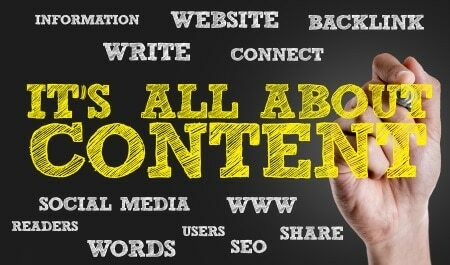 Content is the fuel that should drive your digital marketing strategy. By creating valuable, high quality content that targets specific, well-defined audiences, you’ll do more than attract visitors to your website: You’ll attract the right visitors, who are likely to convert into leads (and customers). Not only that, content will help considerably with your website’s SEO. Remember “off-page” SEO from Part 1? Creating and distributing content is the best way to earn those valuable inbound links from other sites. That can boost your search rankings and help improve your website’s discoverability on the world wide web. One of the best SEO boosters for your website is a blog. A blog makes your website more dynamic by automatically injecting new content every time an article is published. Search engines reward higher rankings to websites that consistently add fresh content, and these higher rankings translate into new visitors and leads for your business. This is where you will want to take off your hat as a business owner or marketing manager and try to think like a magazine publisher. The goal of your business blog should be to publish valuable, non-promotional posts, kinda like a column or an article in an industry magazine would. Also, think about the words you are using. Avoid jargon that only people in your particular industry would understand. This is a good way to alienate your target audience. Instead, think of the words your customers use to describe your business and apply those phrases to your blogging language. Now at this point, the burning question on your mind is probably . . .
Well the short answer come in the form of another question; What are you passionate about? Hopefully your passion and the business you are in are one in the same. Your Blog should have a clear purpose. What are you trying to educate your industry and potential customers about? This education is not about your product. It’s about common industry issues. You want to try and address your potential customer’s pain points, the problems they are facing and, sometimes, the solutions your product or service offer to tackle these challenges. A great way to start blogging is to answer the ten most common questions you get asked by prospective new customers. Do this once a week for ten weeks and you have the foundations of a successful blog. Once those first ten weeks are over, check out your blogging analytics to see which articles resonated the most with your audience. You can measure this through free tools such as Google Analytics or a Content Management System (CMS) . If two or three of the posts received a significantly higher number of views and inbound links, try to expand on the topics at hand. Consider interviewing a coworker to reveal their thoughts on the subject. Remember to let your expertise and passion shine through in your blog content. On that note, here are . . .
A compelling title – A blog post’s title is the first thing people will see, so it should clearly indicate what the article is about. Clarity and specificity attract readers and prompt them to share the post with their networks. Well Written and Formatted Text – The body of your post should be well-written and formatted in a way that makes it easy to read. Consider using header tags and bullet points to break up the content into sections. Ask a coworker or a friend to review the post before you publish. Multimedia content – Relevant multimedia content can make a blog post more memorable and fun to read. It also helps to break up the text to make it more pleasing to the eye. Aim to add at least one relevant image per blog post. Slideshare presentations, video, and info graphics are examples of other multimedia content you can feature. Links – Include in-text links to relevant content, thus helping readers dig deeper into the resources they are most interested in. Your links can, naturally, point to your own internal pages and landing pages to help you generate more leads from your content. 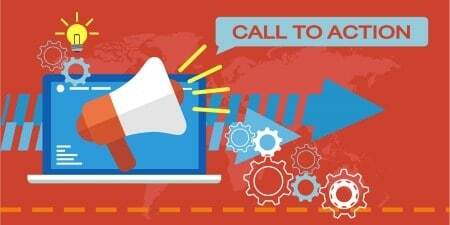 Call-to-Action (CTA) – Each and every blog post you publish should include a relevant call-to-action in the article to help boost lead generation. More on that next . . .
Business blogging presents a fantastic platform for attracting organic traffic and engaging with your audience. But keep in mind that the primary goal of your business blog is to move your website visitors to the next stage in their buyer’s journey . To achieve this goal, add calls-to-action (CTAs) to your posts and have them link to landing pages that provide downloadable access to more in-depth learning materials, such as ebooks or webinars. Make sure to include CTAs both in the sidebar of your blog as well as on every individual post you publish. In addition to image/button CTAs, you can also include text CTAs within the body of your blog content. Of course, blogging isn’t the only way to generate leads using content. Next, we’ll dive into other content formats for generating leads, as the more diverse your content types are, the more people you cater to. While it’s a great place to start, blog content isn’t the only type of content you can create to be successful with digital marketing. You need to produce longer-form content items like ebooks, whitepapers, case studies or research reports that can be used for lead generation. Also consider creating non-text based content like videos tutorials, webinars, templates and free tools. These content “offers” will feed your business conversions. An industry resource that takes some time and effort to put together will provide the type of value visitors are looking for. It might educate, enrich one’s knowledge, or simply entertain. In any case, it has the power to achieve an information exchange: the process in which a visitor fills out a lead capture form to access the resource. The offers you produce shouldn’t be randomly selected. There should be some precise strategy behind that decision. Don’t forget to have a look at your websites analytics. The reporting insights you discover there will help direct you to the types of content that will attract your target audience. For instance, if a whitepaper on heating systems brought you more leads and sales than a webinar on the same topic, you might want to focus on creating more text-based content.